Hi Pam, Since discovering RetroRenovation.com it has become a “must go to site” each morning! Thanks for all the information and enthusiasm you provide. I am about to update some aspects of my 1960s bathroom and two of your posts this week caught my eye – I never thought much about my shower base and was considering replacing it…not anymore! I have an original terrazzo base. 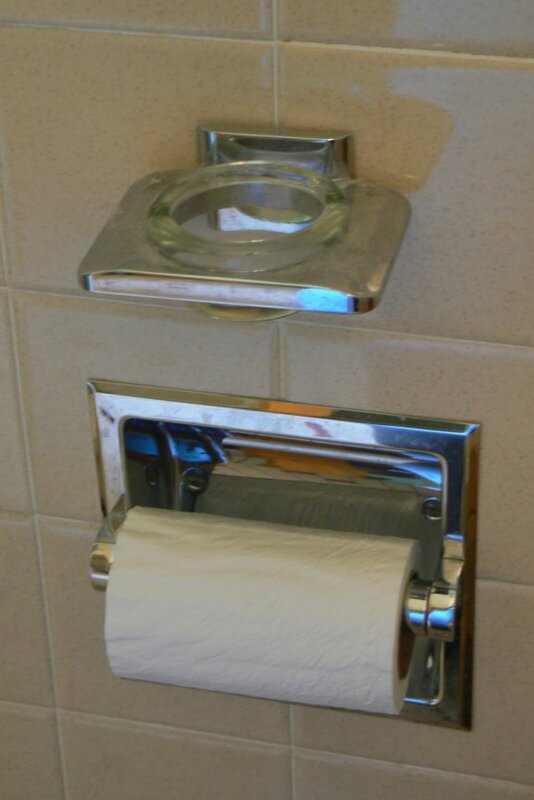 I was also thinking of removing my toilet-side magazine rack. After reading your post about the Hall Mack fixture I know why there’s a little shelf but fortunately I don’t smoke! 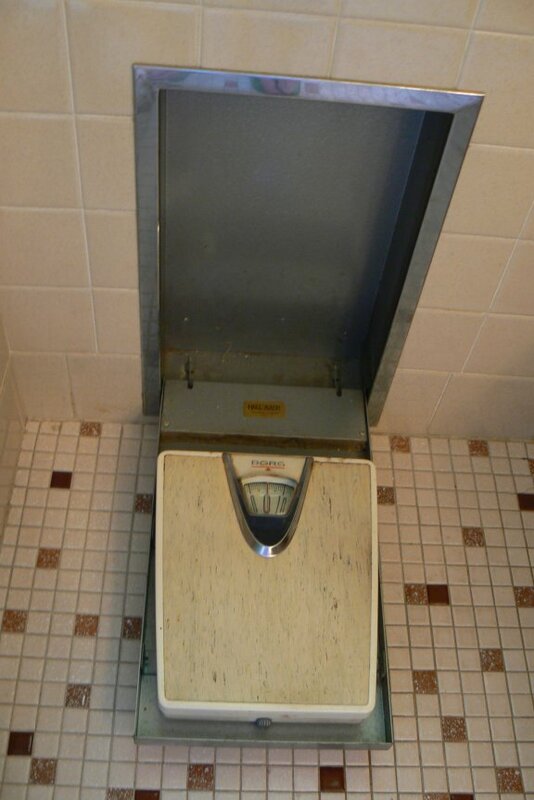 Enclosed are some photos, also one of an ashtray conveniently located on the other side of the toilet!!! I sometimes put a little vase of flowers there! 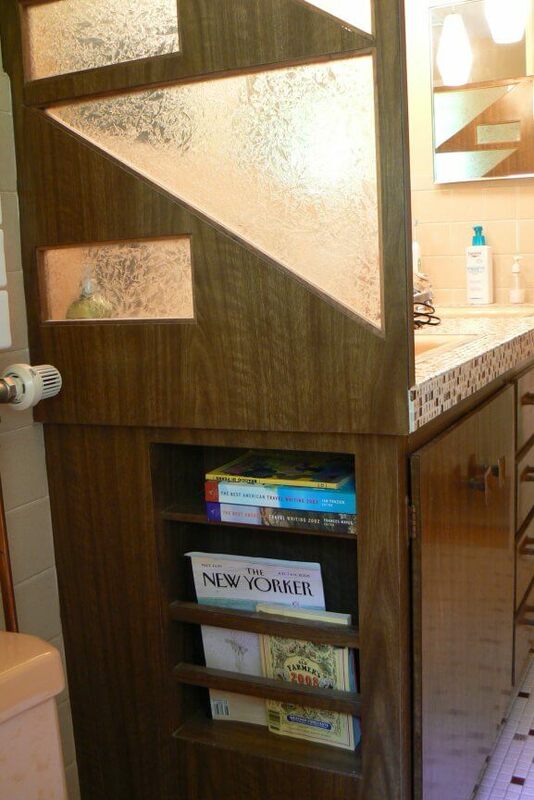 Note the privacy panel above the magazine rack and the recessed scale that opens up when needed! 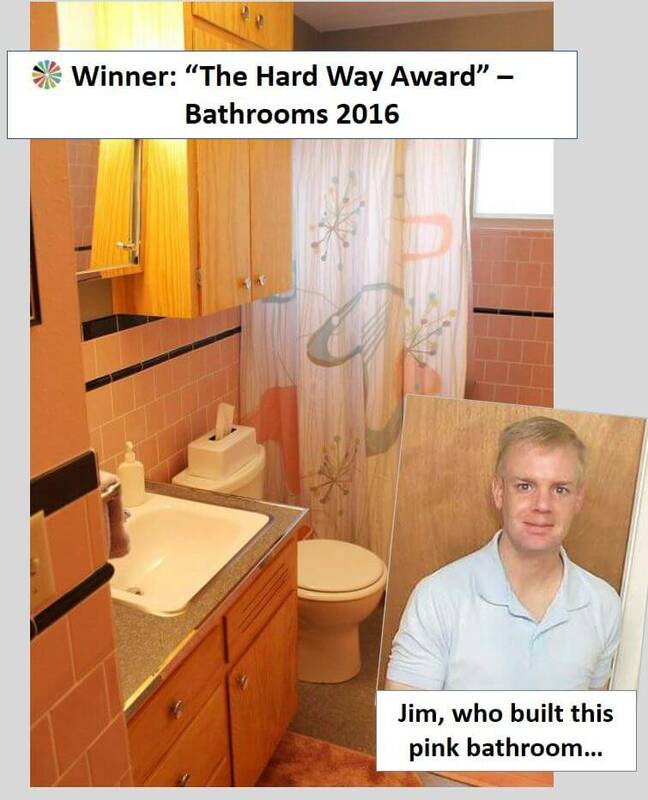 The bathroom project will involve new tiles in shower stall and bathroom floor, laminate refacing on vanity/privacy panel and paint the walls a different color. I was happy with the bathroom the way it is but the moisture in the shower has seeped behind the grout and has been absorbed by the sheetrock……it can’t be regrouted again, so that’s what got me started. Everything else will stay as is. 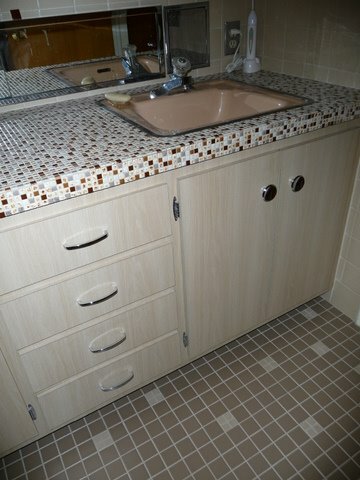 The wall tiles are oatmeal in color and say romany spartan on the back. I doubt I can find the exact ones so will look for something that will coordinate – I will let you know, and can send you some “after” pictures if you’d like. I’m going to try to retain the 1960s look through use of colors and style. If you know of any vendors I should consider please let me know! I’m also attaching a few kitchen photos. I renovated 2 years ago and although it’s not 100% loyal to 1960s materials, one thing I did was use laminate for my *cabinets*. I highly recommend it for ranch houses of this era….It gives a wonderful European/1960s look and is incredibly easy to care for. 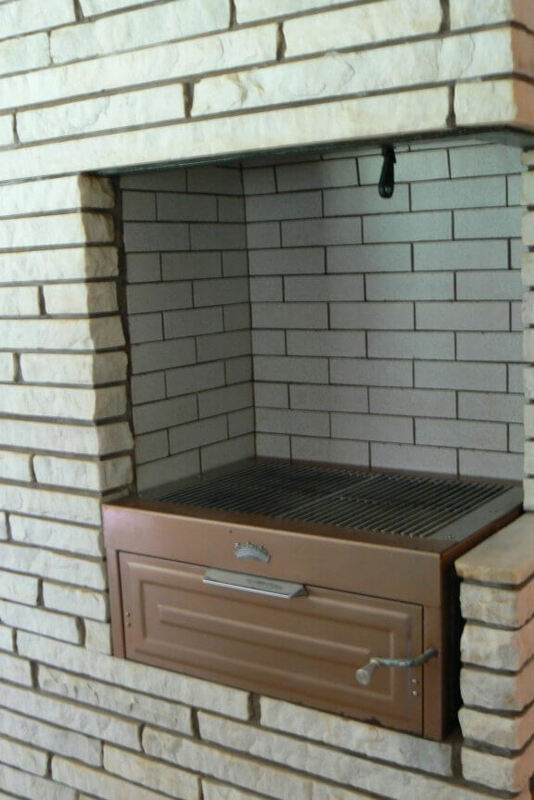 The original kitchen also has an indoor barbecue grill with its own damper and chimney flue…..it works beautifully with wood chips and is a constant source of conversation! It would be great to meet you….let me know when you come this way, I could show you some of the 1960s neighborhoods in Holyoke! Thanks again for your wonderful site! Regarding replicating your ‘vintage wallpaper’ – which is FABULOUS – onto tile – that sounds like a great idea, but I’m not sure how to get it done. There must be sources. Readers? 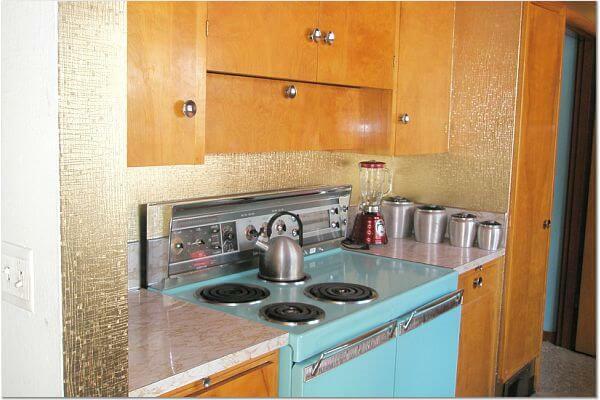 Your kitchen looks awesome – and you know what, laminate cabinets ARE retro-authentic. 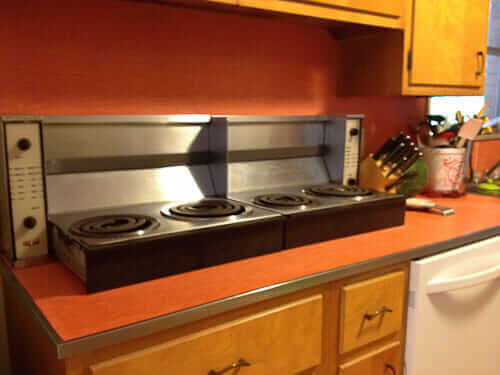 I need to research the exact date I start seeing Formica cabinets appear in magazines – but I’m pretty sure it’s by the late 50s. And finally…a tour of vintage Holyoke? I am in!! I am due a trip soon over to a secret retro junk location…to that big garden store in Hadley…and to the Trader Joe’s. I’ll email to set a date, I’m serious! We just bought a sixty’s ranch with that same grill. How do you cook with wood chips. Is charcoal save to use in it? I have a 1960s retro home looking to be updated in West Springfield,Ma. I’ve used the indoor grill and it gets a bit Smokey in the House. The chimney has been cleaned and has a clear shot out the top. Is there some sort of way to create a better airflow? Any recommendations on what type of fuel to burn to Avoid this? I’ve used seasoned oak for cooking. I was thinking hardwood lump charcoal and I have a carbon monoxide detector about 20 feet away. Any suggestions would be helpful. Thanks Mark. Mark, on issues like this — which involve safety concerns — consult with professionals.